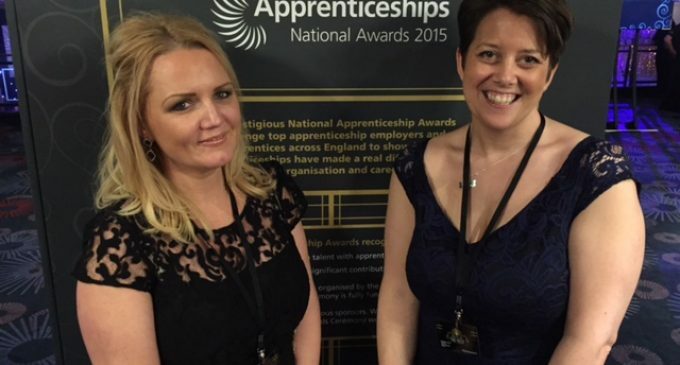 Compass Group UK & Ireland has been named a Top 100 Apprenticeship Employer for the first time at the National Apprenticeship Awards in London yesterday. The list, which is compiled annually by the National Apprenticeship Service, recognises the businesses with the highest standards of excellence in employing apprentices. The company was shortlisted for the list after winning the BT Award for the West Midlands Macro Employer of the Year at the Regional Apprenticeship Awards, last October. Sue Husband, Director of the National Apprenticeship Service, added: ‘The top 100 Apprenticeship Employer list 2015 demonstrates clearly the impact apprentices can have on an organisation. ‘These top 100 employers have made a difference to the lives of young people by investing in their future. Apprentices themselves, meanwhile, help employers to develop a skilled, qualified workforce which helps to build a stronger economy. Photo shows Nicola Parkinson and Jo Bradford at the ceremony yesterday.